فلاحت, محمدصادق, شهیدی, صمد. (1394). نقش مفهوم توده - فضا در تبیین مکان معماری. ماهنامه علمی پژوهشی باغ نظر, 12(35), 27-38. محمدصادق فلاحت; صمد شهیدی. "نقش مفهوم توده - فضا در تبیین مکان معماری". ماهنامه علمی پژوهشی باغ نظر, 12, 35, 1394, 27-38. فلاحت, محمدصادق, شهیدی, صمد. (1394). 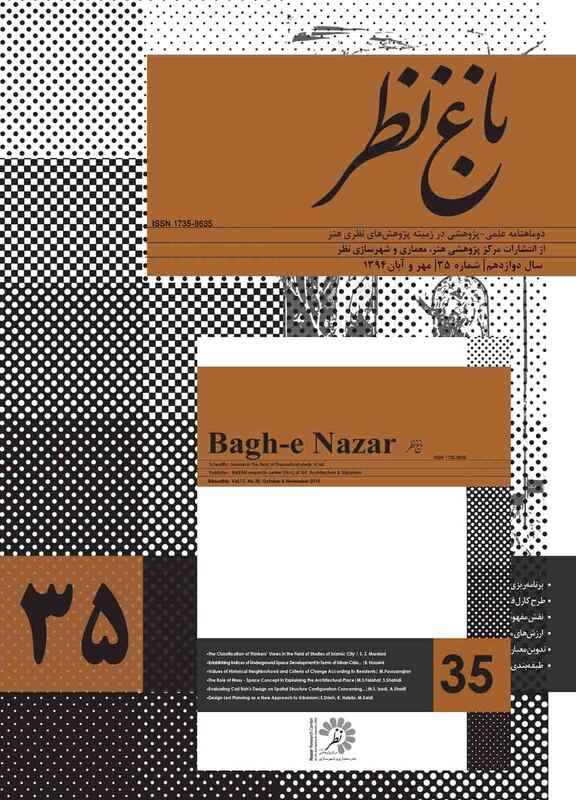 'نقش مفهوم توده - فضا در تبیین مکان معماری', ماهنامه علمی پژوهشی باغ نظر, 12(35), pp. 27-38. فلاحت, محمدصادق, شهیدی, صمد. نقش مفهوم توده - فضا در تبیین مکان معماری. ماهنامه علمی پژوهشی باغ نظر, 1394; 12(35): 27-38. 1. استادیار دانشگاه زنجان، زنجان، ایران. شناخت ویژگی‌های معماری منوط به بررسی مؤلفه‌های کالبدی - که به طورکلی «توده» نام دارد - و درک ویژگی‌هایی با حضور «عدم توده» - که فضا نام دارد -محقق می‌شود. معماری از موجودیت توده و فضا مستقل نبوده و کیفیت‌های مختلف فضای معماری از نسبت‌های مختلف توده و فضا شکل می‌گیرد که نظام توده - فضا نامیده می‌شود. در واقع نظام توده - فضای معماری با ایجاد ساختارهای کالبدی - ادراکی و کالبدی - عملکردی، فضای معماری باکیفیت‌های متفاوت خلق می‌کند. از این رو شناخت نظام توده - فضا و ویژگی‌های آن می‌تواند شناخت طراحان و معماران را نسبت به کیفیت فضا و مکان معماری ارتقا دهد. این مقاله با طرح فرضیه‌های زیر تلاش می‌کند نقش بنیادین و مؤثر نظام توده - فضا را در کیفیت مکان تبیین کند : الف. نظام توده - فضا مفهومی بنیادین و سرآغاز و بن‌مایه امر معماری است، ب. نظام توده - فضا موجب ظهور کالبدی و ادراکی اثر معماری شده و نظام ساختاری مکان را ایجاد می‌کند و پ. نظام توده - فضا در طول زمان با ایجاد ساختارهای کالبدی - ادراکی و کالبدی - عملکردی، فعالیت‌ها و معانی مکان را ایجاد کرده و موجب تجلی آن می‌شود. جهت تبیین فرضیه‌ها ابتدا نظام توده - فضا بررسی شده و اجزای آن توضیح داده می‌شود، سپس مؤلفه‌های اصلی مکان معرفی شده و عناصر معماری و مکان مقایسه و تفسیر می‌شوند. روش تحقیق این مقاله براساس روش توصیفی - تحلیلی و استدلال منطقی پایه‌ریزی شده و مبتنی بر بررسی و تحلیل اطلاعات کتابخانه‌ای، مقایسه، تفسیر و نتیجه‌گیری از آنهاست. در نهایت این پژوهش نشان می‌دهد که سه شاخصه “محصوریت”، “نحوه حرکت” و “تناسبات” حاصل از نظام توده – فضا، کیفیت مکان معماری را آشکار می‌کند. Knowing the characteristics of the architecture is required for assessing its physical components - generally called “mass”- and understanding of the characteristics which are accomplished in the presence of “non-mass” -that is called space-. Architecture is not independent of the existence of mass and space; the different qualities of architectural spaces are formed by different ratios of the mass and space concepts called mass – space system. Indeed, the architectural mass - space system creates architectural spaces with different qualities by creating physical - cognitive and physical – functional structures. Therefore, the recognition of the mass - space system and its characteristics can improve the knowledge of designers and architects about the quality of architectural space and place. In the architecture literatures of the past century, space and place terminology have been widely used. The meaning of these two words are sometimes so close together that have almost one meaning and sometimes they are completely distinct, sometimes they have specific meaning, and sometimes they have a complex, mental, cultural and unclear concept. Different definitions presented for these concepts in the fields of philosophy, science, phenomenology and psychology show that there is a fundamental relationship between space and place. Evaluation of concepts show that space is an abstract concept compared to the place, that means space is a location and area for things but the place is a space combined with the human characteristics. According to these hypotheses This article attempts to explain the fundamental and effective role of the mass - space system in the quality of place: a. The mass - space system is a fundamental concept which is the origin and the foundation of architecture, b. Mass - space system causes illustration of the physical and conceptual characteristics of architectural works as well as providing structure of place and c. Mass - space system over time by creating physical - cognitive and physical – functional structures provides activities and meanings of the place therefore causes it to be manifested. In order to explain the hypotheses, firstly mass - space system is evaluated and its components are explained, and then the main components of the place are proposed and components of architecture and place are compared and interpreted. The methodology of this study is based on descriptive - analytical method and logical reasoning and is based on the investigation and analysis, comparison, interpretation of related documents. Finally, this study shows that three characteristics of “restriction”, “circulation style” and “proportion” that are resulted from the mass - space system, reveal the quality of architectural place. Actually, the mass - space system is a collection of two main parts of matter and idea that matter refers to amorphous and non-limited area, which have the capacity of accepting the architectural idea and the idea introduces the structural relationship between meaning and function. Despite the fact that the architectural matter is generally known to be physical subject, based on the presented definitions of mass – space system, even the amorphous space is the matter, so when the architectural idea influences amorphous space and mass, then these concepts obtain form and shape and mass – space system is created as a mental subject as opposed to the mass. In addition, knowing the architecture effect means the study of physical properties of mass and cognitive properties of space. In other words, all physical and metaphysical features and capabilities of the architecture cannot be attributed to the space concept.